Every business owner and entrepreneur knows efficiency is imperative. Without smooth daily operations, it is impossible to set and reach market goals. In an effort to increase the company productivity, many business professionals are turning to technology for accessible and affordable solutions. If you are looking to improve your enterprise’s functionality, consider incorporating the following applications into your existing business model. Box allows your employees to collaborate on, share, upload and download files. You can assign projects to various individuals and have a comment feed. If you already have a Google Docs or Salesforce-based project management system, you don’t have rewrite or rework your various files. Box allows you to integrate your existing documents into the application. In light of the last decades many hacking scandals, keeping passwords and sensitive information is more important than ever. LastPass is a free program that helps you generate and store your passwords. This program is particularly useful because it works for mobile platforms in addition to traditional website logins. You can also arrange a multi-factor authentication process, which increases the security for your system. Imagine if you could have Twitter and Facebook all to yourself. Yammer is a private social media network that you can share with your team. You get the speed and functionality of social media, but you can share important files while connecting with partners and customers. Yammer allows you to try it out for free. Afterwards, you can choose to upgrade for $5 per person monthly. Do you have too many emails? Use Sanebox to restore some sense of order to your email account. After you install the program, it will filter your emails into priority communications and less urgent content. The first goes into your inbox, while the latter is put into a read later folder. If you receive high volumes of daily emails, you can use this program to unclutter and organize. If you need a project management system, Hubble is an excellent tool. Features include collaborative document and project work, file sharing and task management. You can use this service to provide a centralized space for your team members and priorities. Start with a two-week free trial to see if the shoe fits. If you are looking for a project management system that combines equal parts Pinterest and Basecamp HQ, Trello might be a great fit for your company. With this application, you can create content boards and manage your employees and resources. Additionally, Trello provides task management tools. The best part about this easy to use program is you won’t have to pay a dime. It’s free! Do you have a bunch of PDF spreadsheets that you need to put into Excel? Don’t worry about delegating an assistant to a long and tedious data entry project. Instead, convert PDF to excel with PDF2XL. This PDF to Excel converter can covert up to 500 pages a minute and you can use both scanned and digital files. You’ll get editable spreadsheets without the human error. Does your company use multiple social media platforms? While you can link some accounts to cross post content, savvy media managers know that what works for Tumblr may not work for Twitter. Buffer allows you to manage all of your social media from a single interface. Plus, the app provides an analytics back-end. Mention is similar to Google Alerts, but it also gives you instant updates on keyword tends in real time. This means you can have an incredibly responsive web presence and make marketing or media adjustments as necessary. If you want a complete understanding of who’s talking about you and what topics they are interested in, Mention may be a true asset to your marketing strategy. HipChat is a private chat tool that allows for private messaging between company members. If you are concerned with meeting projects on strict deadlines, your internal communications must be both efficient and responsive. Meetings and memos require significant time and resources to orchestrate, but online chats can accomplish the same information flow on a much quicker timeline. Online storage applications like Dropbox allow you to store and organize files in a cloud. While there are other similar services, Dropbox is unique in that once installed, you can save files to the cloud directly from a computer without using a browser or opening an app. Any mobile device or computer with the free application can access files at any time. Business owners can purchase more cloud space if necessary. Does your company depend on the information stored in your Google Docs? Get easy mobile access with GoDocs. You can upload, edit and sort documents from your phone no matter where you are. The app comes with a one-time fee and adds convenience to your business experience. For some business owners, staying ahead of trends and news within the industry is crucial to remaining successful. Pocket is a content app that lets you save important articles, videos and other media to watch and read later. Once the media is in the app, you can view it anywhere from any device whether you are on or offline. Do you ever need to send important or sensitive information within your cloud? YouSendIt allows you to do just that while effectively managing your company content. You can share folders, sign documents and send files in a secure fashion. Basic services are free of charge, but more advances features like unlimited storage are available for a fee. To decide which applications are best for you enterprise, consider your problem areas and what kind of solutions would increase efficiency. For instance, do you need a project management or social media solution? Once you hone in on what your business most needs, use this list of applications to guide you towards the appropriate technology. Remember, increased productivity can arise from a simple tweak in the system. 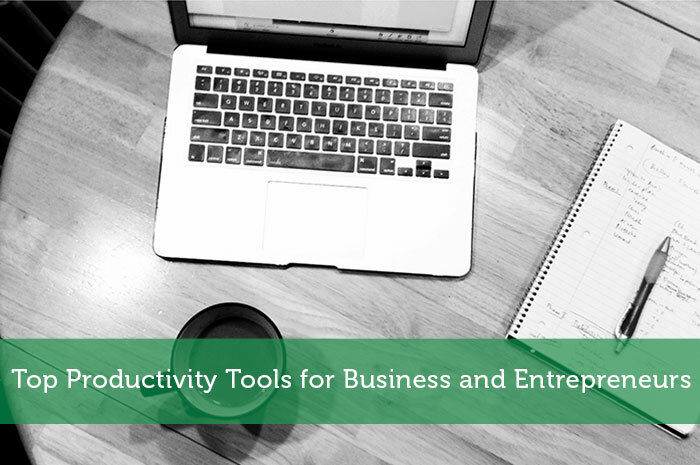 My favourite productivity tools are proofhub for project management, slack for collaboration and dropbox for files storage. Helped our team to stay productive. Dropbox is the only one that i use from this list. My company also uses the last Office package and is very useful.